I’ve had my MacBook for a total of 4 months now and have generally loved the little machine, so much so that I switched to Mac completely, dropping Windows and buying a Mac Pro. There has however been one problem that has cropped up recently that is rather frustrating. The front of the MacBook palm rest area has developed a hair-line crack in it. I treat this machine quite well and am very careful with it so the fact that it cracked after just four months of ownership is pretty disappointing. When I say I treat it well I mean "kid gloves" well. I’ve never dropped the machine or even handled it roughly. I gently open and close the lid, careful not to let it slam shut. If I take it anywhere it is immediately placed into a snug black neoprene Incase sleeve. Travel means the MacBook is first placed inside the Incase sleeve and then placed inside a padded laptop briefcase. Kid gloves. My oldest daughter’s MacBook on the other hand has developed no such crack, even though it is 7 months older and treated with a tiny fraction of the care mine receives. Hers has a large decal on the shell and makeup stains from residing in her cramped college dorm room. When it’s not laying around on a couch or coffee table it is crammed into a large bag with enough female products to go camping for several weeks. Yet hers is fine. I did a little research on the interwebs and sure enough a large number of people have experienced the same exact problem I have. It even got so bad that Fake Steve Jobs put up a note about it in December. Not pleased about this I called up Apple Care. The gentleman told me that I could either take the machine to a nearby Apple store for repair or they would send out a box so that I could pack up my precious machine, ship it to them for repair, then they would send it back to me. Since I have an Apple store about 30 minutes away that was my preferred method. The earliest I can get to the Apple Care store is Monday so this will have to wait until then; I’ll add information on this as I go. When I put up a post in April about how to clean a MacBook case with Mr. Clean Magic Erasers Charles mentioned in the comments that the top of the case may be one of the "problem" ones that were not varnished properly. Hopefully when this is repaired it will address the fact that the palm rests gets dirty so easily too. In the meantime I will be using a machine that sharply pokes right into underside of my wrist as I type. 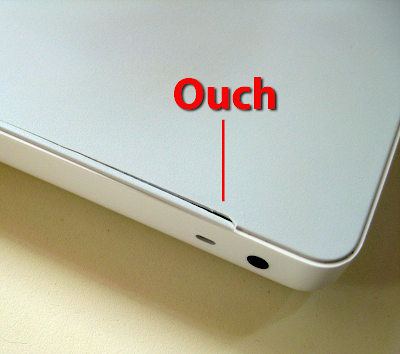 Update: Check out this Flickr group dedicated to MacBook case cracks.